The Emerald Buddha statue was made the Jadeite. He was adorned with garments made of gold. There are three different sets of gold clothing, which are changed by the King of Thailand or a liaison in a ceremony at the changing of the seasons - in the 1st Waning of Lunar Months 4, 8 and 12 (around March, July and November). The three sets of gold garments correspond to Thailand's summer season, rainy season, and cool season. The two sets of gold clothing not in use at any given time are kept on display in the nearby Pavilion of Regalia, Royal Decorations and Thai Coins on the grounds of the Grand Palace. 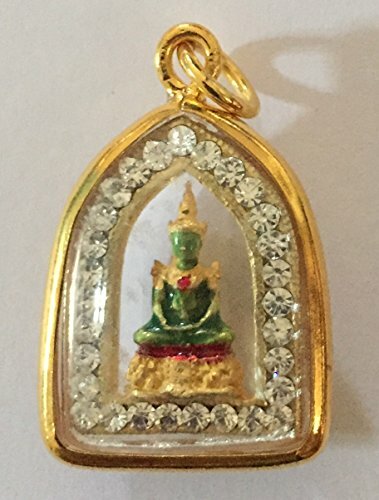 Thai people believe this Emerald Buddha " Phra Kaew Morakot " will bring you are better life, bring good luck, will ward off evil and made you all wish come true. 1 set contains. Holy talisman, wrist strap Montra, Free necklace Veda genuine by Mr.San Power only.